A scale tells you how much you gross weight you carry, but it can't tell you what type of tissue comprises that weight. Even if you have a healthy weight, your body fat levels might pose a health risk. A percentage of more than 30 percent for women, and 20 percent for men, makes it more likely for you to be vulnerable to the diseases that usually afflict people who are overweight or obese, notes Today's Dietitian. 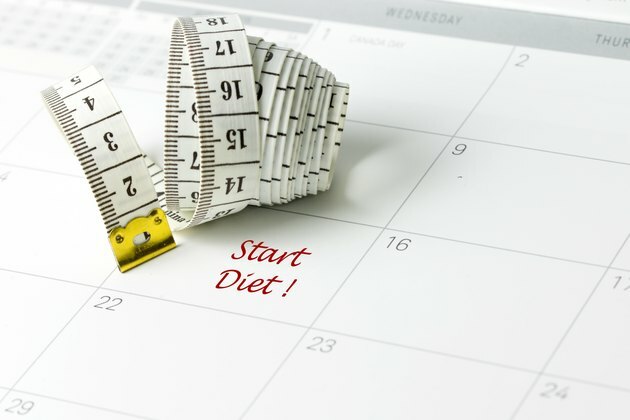 Guidelines for weight loss state that you should plan to lose 1 to 2 pounds of weight per week, but no such comprehensive guidelines for rate of body fat loss exist. The American Council on Exercise asserts, though, that you can safely and successfully plan on losing about 1 percent of your body fat per month. Your body is composed of fat tissue and lean tissue. Lean mass tissue consists of muscle, as well as your internal organs, bones and connective tissues. Fat in some areas of your body is essential, such as that around and inside the internal organs, while other fat is storage fat, such as the type that expands your waistband. Men require 2 to 5 percent fat, and women need 10 to 13 percent to support basic body functions. Measuring your body fat levels provides an indication that you have a healthy amount of storage fat, or if it's excessive and endangers your health. Body fat percentage also affects your appearance. Being leaner, but not too lean, means your muscles look more prominent and you appear healthier. Fit, healthy women generally have a body fat percentage of 21 to 24 percent, while men have 14 to 17 percent body fat. Athletes usually carry a lower amount of body fat than the average, fit person because excess fat can hamper their physical performance. Women athletes usually fall between 14 and 20 percent, and male athletes between 6 and 13 percent. Women carry more body fat than men because of child bearing. Body fat is presented as a range of values, rather than an absolute, because different body types and ages affect the exact number. When you grow older than 20, you'll gain about 1 to 3 percent of fat every 10 years up until the age of 60. You also naturally lose lean body mass in the form of muscle and bone as you age. A 60-year-old person who hasn't been physically active may end up with twice the amount of fat he had at age 20, even if his gross weight hasn't changed. Methods of measuring body fat can also be rough estimates, unless you invest in a medical procedure such as underwater weighing or a DEXA scan. Body fat scales use electrical impudence, which sends a mild current through your body. These are notoriously finicky, and the results depend on your hydration levels. Body-fat caliper readings performed by a fitness professional may give you a more accurate assessment but are subject to user error. Weight loss doesn't always mean fat loss. If you don't strength train as you reduce your calorie intake, 25 percent of every pound you lose will be in the form of lean muscle mass. To lose body fat primarily, you must create a calorie deficit by moving more and eating fewer calories. Trying to lose weight too fast, though, can expedite loss of muscle -- not loss of fat. If you're close to your goal weight, you may need to slow down your rate of overall weight loss to just 1/2 pound per week. This is compared to the commonly recommended 1- to 2-pound per week rate of loss. As you get leaner, your body desperately wants to hold onto the fat you have to protect you from a possible famine. Preserving valuable lean muscle mass and losing fat will help you achieve a 1 percent body-fat loss per month, but exercise must be part of the weight-loss equation to make this happen. Cardiovascular exercise plays a role in your health and how many calories you burn, so aim for at least 150 minutes per week at a moderate intensity. Strength training, though, is key in preserving and building muscle. Aim for at least two full-body sessions per week and use weights that feel challenging by the last repetition in a set of eight to 12. Additional sets may be an asset to your body fat loss as you become stronger. Eat an adequate amount of protein, too, even as you reduce calories. You'll need between 20 and 30 grams at four meals, and a serving after strength training, to support muscle development. What Is the Optimal Body Fat Percentage for a 50-Year-Old Woman? What Is Healthy Body Fat for a 30-Year-Old Male?